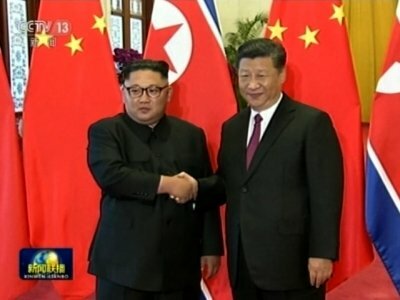 BEIJING (AP) — Chinese President Xi Jinping told North Korean leader Kim Jong Un on Tuesday he hopes Pyongyang and Washington can fully implement the outcome of last week’s nuclear summit at which Kim pledged to work toward denuclearization in exchange for U.S. security guarantees. State broadcaster CCTV said Xi told Kim that through the “concerted efforts of the relevant countries” negotiations regarding issues on the Korean Peninsula are back on track and the overall situation is moving in the direction of peace and stability. The summit between Kim and U.S. President Donald Trump in Singapore marked an “important step toward the political solution of the Korean Peninsula nuclear issue,” Xi was quoted as saying in the meeting at the Great Hall of the People in central Beijing. China hopes North Korea and the U.S. can “implement well the outcomes achieved at the summit,” Xi said. China would “as always play a constructive role” in that process, he said. Kim’s two-day visit to China, which began Tuesday, had not been announced in advance but was expected as part of the Communist neighbors’ tradition to report to each other on major developments. The visit is Kim’s third to China since March, highlighting China’s crucial role in efforts by the U.S. and others to get North Korea to abandon its nuclear program. The U.S. has long looked to China to use its influence with North Korea to bring it to negotiations, but the visit comes as ties between Beijing and Washington are being tested by a major trade dispute. China’s official Xinhua News Agency announced the North Korean leader’s visit shortly after he apparently landed Tuesday morning, dispensing with the secrecy shrouding previous trips to China by Kim and his father and predecessor, Kim Jong Il. On the younger Kim’s first visit to China as leader, he took an armored train as his father had. His first two trips were not announced until after he had safely returned to North Korea. Xi “is exerting a lot of influence from behind the scenes,” said Bonnie Glaser, senior adviser for Asia at the Center for Strategic and International Studies in Washington. “I expect they will talk about the path going forward and where priorities should lie,” Glaser said. Those priorities, from China’s perspective, would be to ensure that Beijing is included in any peace treaty talks and in creating an environment on the Korean Peninsula that will make it unnecessary for U.S. troops to remain. Kim is likely hoping to get China’s support for relief from punishing U.N. sanctions. At a regularly scheduled briefing, Chinese Foreign Ministry spokesman Geng Shuang said Tuesday that Beijing supported Russia’s calls last week for unilateral sanctions on North Korea — ones that aren’t imposed within the United Nations framework — to be canceled immediately. “China always stands against the so-called unilateral sanctions outside the Security Council framework. This position is very clear and we believe sanctions themselves are not the end,” Geng said. Trump’s surprise announcement in Singapore of a U.S. suspension of military drills with its South Korean ally fulfills a goal long pursued by North Korea and its primary backers China and Russia. That move is seen as potentially weakening defenses and diplomacy among America’s Asian allies, while bolstering China and Russia. The U.S. has stationed combat troops in South Korea since the Korean War, in which China fought on North Korea’s side and which ended in 1953 with an armistice and no peace treaty. South Korea’s Foreign Ministry said Kim’s visit to China highlights the “constructive role” Beijing could play in disarming North Korea. Cheng Xiaohe, an associate professor at Renmin University’s School of International Studies in Beijing, said it was significant that Chinese state broadcaster CCTV announced Kim’s visit before his return home. Yang Mu-jin, a professor at the University of North Korean Studies in Seoul, said Kim’s visits show the recent chill in the two countries’ ties over Kim’s development of nuclear weapons and long-range missiles had fully lifted. “I believe that indicates that the blood alliance between the North and China has been completely restored,” Yang said. Washington has long pressed Beijing to use its influence to compel North Korea into negotiations, but Kim’s visit comes as a dispute over the large trade imbalance between China and the U.S. has been escalating, moving them closer to a potential trade war.